The National Minority Quality Forum launched a new database to help increase awareness about the prevalence of peripheral arterial disease (P.A.D.) and to identify groups that may be most affected. The P.A.D. Atlas maps by zip code the disease’s prevalence down to the street level. Users can create color-coded maps that depict national, state, county, and city P.A.D. prevalence. The database can also search by age, gender, and race/ethnicity. P.A.D. is a type of cardiovascular disease that doubles the risk of a heart attack or stroke and primarily affects individuals over 50 years of age. Approximately nine million Americans suffer from P.A.D., and of that number more than one million African Americans have been diagnosed. The cities with the most diagnosed cases of P.A.D. are Chicago, New York City, Philadelphia, Houston, and Los Angeles. P.A.D. is even more common in African Americans and Hispanics who have diabetes, reports the Peripheral Arterial Disease Coalition, an alliance of health professionals and government agencies. The NMQF collaborated with the coalition and drew support from the Bristol-Myers Squibb/Sanofi Pharmaceuticals Partnership to develop the database. In addition to the P.A.D. 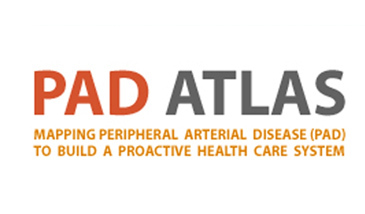 Atlas, the NMQF also developed atlases for kidney disease, diabetes, cardiovascular disease, and HIV/AIDS. They also plan to release an obesity atlas and an acute coronary syndrome/stroke atlas for 2009. Researchers, patient advocacy groups, legislators, and health professionals can use the constantly updated database to direct educational resources to communities most affected by the disease.